You are in the jewel of the crown with the mercury Bay in front of you and all the adventures you could wish for. Head up over to Otama and Opito bays gorgeous white sandy beaches with aqua ocean to swim in. Turn left at bottom of the hill and head into Whitianga township and have a yummy coffee and brekkie before catching the ferry over to front beach, flaxmill bay, walk up shakespeare cliff and take some fab pics of the bay. Head down the track to Lonely bay for a swim then carry on up and over to cooks beach, walk down to the Purangi for another dip and explore. Head back to cooks beach village and grab an icecream before making the trek back to the ferry, maybe stop in at Eggcentric Cafe for a cold one. Back in Whitianga, big day head back to the mini blondes and relax. I am passionate about recycling and preloved decor which I have incorporated into my cottages. Interior decor which is the industry I work in is my inspiration and landscape and design which I have created in my gardens. ..
A unique experience of tiny home living. 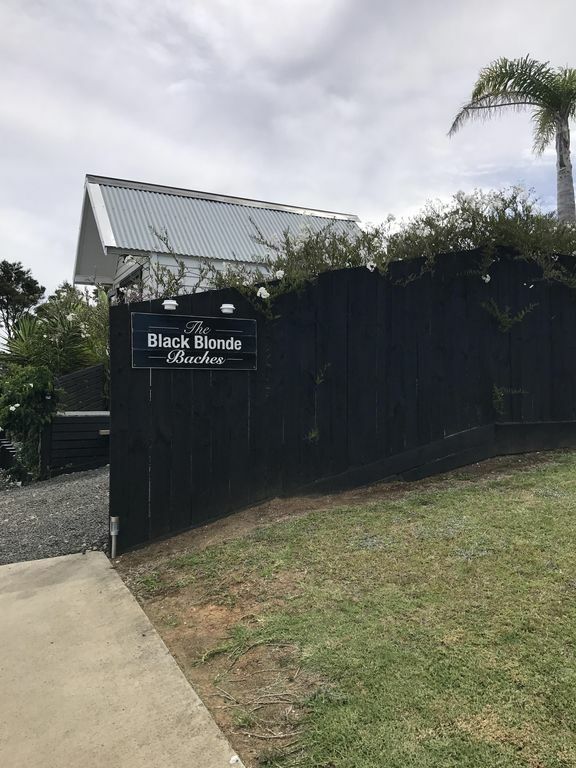 The Black Blonde Baches were a dream that I always wanted to create on my property and share, they are a fabulous way to experience tiny home living with the benefits of an amazing sea,coastal view. Private and set amongst tropical plantings they have beautiful character of there own with all the little extras to make your stay comfortable and romantic. Bathroom, kitchen facilities is across drive with fabulous shower,vanity,toilet, and small kitchen sink with washing products and towels. Washing machine,powder,iron and board and heating. Basket of small toiletries, bathroom and beach towels. Free standing heaters and heated towel rail in bathroom. cold water only, washing powder provided. Lovely comfortable couch with throws and cushions and a fabulous view!! Small breakfast bar with bar stools, TV and video, radio,cd. Magazines and board games ,side tables and lamp. In the first cottage there is a bench with microwave,toaster, jug and coffee plunger,tea,sugar, and cooking condiments. Glasses and all crockery provided. Small balcony at front of cottage . Covered in deck area which can be opened . A lovely well maintained place with a cozy atmosphere close to good amenities and beautiful beaches. A very friendly and helpful host made us feel very welcome! Polite,friendly guests, highly recommend for future hosts left the cottages lovely and tidy. Super couple, loved having them to stay at the black blonde baches, polite,took great care in leaving the baches spotless and would highly recommend to any future hosts. Lovely example of ‘tiny living’! Beautiful little property spread over three cottages, well equipped and lovely interiors. Great Seaview! Great experience at Anna’s place. We really enjoyed our stay there and would love to go back. Very charming property with great views. Clean and comfortable. Had all the little extras. We were fortunate to have wonderful weather, but you did have to walk down to a separate bathroom outside.